You may be able to find airline travel pillows on your next flight, but are they as comfy (and as clean) as you would like? Have you considered purchasing a travel pillow to take with you the next time you fly? If you've ever taken a long flight or extended car or bus trip, you know how stiff and sore your whole upper body can get. Sitting in any place for too long can wreak havoc, especially in areas that are prone to tense up anyway, such as your neck, back, and shoulders. Relief often isn't found until you are able to stand up, stretch, and move around-an improbable idea in a car or an airplane, at least for more than a minute or two. It only makes sense that your trip will be much more pleasurable if you can find a bit of comfort. Travel pillows are a great way to make life a little easier when you travel. For many, however, those thin travel pillows that are frequently stocked on airplanes just don't get it. Even if you don't have a germ phobia, you may not like the idea of using a pillow that has been used by countless other passengers, even if the airline claims to clean each pillow between use. The answer? Purchase your own travel pillow, and take it with you wherever you go! If you haven't shopped for airline travel pillows before, you might be surprised at the many features that are available. Depending upon the design you prefer, you can find travel pillows that support from the front or the back. A front support pillow allows a passenger to lean forward comfortably. You can place your head down and sleep without worrying or feeling your head jerk and flop each time you doze off. If this is the type of support you are looking for, look for a pillow that is shaped to fit on the airplane's food service tray. Horseshoe shaped neck pillows are the most common travel pillows. These are usually filled with beads and covered with a breathable material, such as cotton or plush polyester. There are animal shaped pillows designed for children as well. These are great for keeping little ones' heads in place as they drift off to sleep during a long (or short) trip. For a great selection of these kid-friendly travel pillows, check out Critter Pillers. Many travel pillows are inflatable, making them easy to store and just as easy to use. Look for inflatable pillows that can be blown up in just two or three breaths. The best inflatable pillows feature a release valve that gets rid of the air in seconds. Once deflated, these pillows can be stored in your carry-on bag, purse, etc. Check out Eagle Creek's inflatable travel pillows. The most popular travel pillows offer one-touch buttons and easy-to-use valves that put customized comfort first. Look for airline travel pillows that have removable fleece covers, which make cleaning a breeze. Megellans has one that you'll love. Brookstone offers a broad selection of travel pillows. You can find u-shaped pillows, lumbar pillows, wedge-shaped pillows, and even 3-in-1 pillows, such as the Tempur-Pedic. This pillow was developed for NASA and reacts to body heat by molding itself to the shape of your neck and head, elminating pressure points and providing maximum comfort. If you need more back support, you might want to purchase Brookstone's travel seat and back pillows which provide instant, packable support for your seat and back. 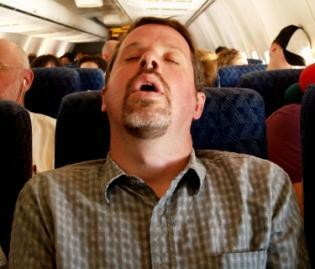 So, just because you've found cheap airfare or you are only taking a short flight, you don't have to sacrifice comfort.